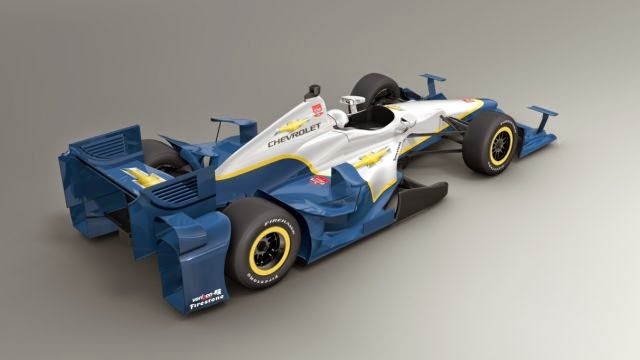 Chevy released their 2015 IndyCar Aero Kit design on Tuesday at IndyCar Media Day. 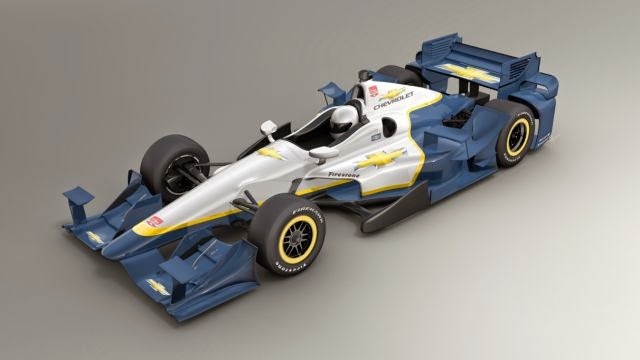 The Chevy IndyCar team revealed their Aero Kit for the 2015 season on Tuesday at IndyCar Media Day. Honda has yet to show off their plans or any images of the car. A collection of photos from the release as well as a breakdown of the parts and design features can be found below. 1. The front wing has new “uppers” that were not previously featured on the car. They are mounted on a pedestal in front of the end plates. These essentially work like the front and rear wings do, increasing down-force on the car without adding too much drag; they have a very thin and streamlined profile. 2. The “wheel wedges” that we saw last year are back again, but with a slightly different shape in front of the tire. They are much smaller and do not attach directly to the side pod like we saw last year, they are separate and further back from the pod. This reduces the overall profile of the car and cuts out some extra material weight. 3. The overall shape and size of the car, specifically with the engine cover and side pods, is reduced. This is due to a newly designed turbocharger and exhaust system that is smaller and more compact than last year’s. This will increase aerodynamic performance, especially on the large ovals such as Indy. 4. The “top flick” element is also new to this year’s cars. This feature wasn’t on the 2013 model; there was nothing on top of the “bumper pod.” This plays a role in aerodynamic down-force on the car (more below). 5. The rear “end plates” are grooved and feature grills instead of being solid as they were last year. This does cut out some weight but could hinder some aerodynamic performance with disturbed air getting caught up in the grills; more on this. 6. The “bumper pods” are larger than they were last year, coming up above the rear of the wheel. This will again increase safety and make it even harder for cars to drive up onto the back of one another. They also have the “top flick” on them. The pods are not directly attached to the rear wing. 7. The “upper flick” and “main flick” are two new additions to the car. Just like the top flick, they are essentially holes for the fair to pass through without creating a tremendous amount of increased drag while increasing down force. I wouldn’t be surprised if the “oval” version of the Aero Kit has smaller “flicks” to get rid of some of the down-force it’s creating. Their specific use will be further detailed in an upcoming post. That’s all for the first technical analysis of Chevy’s 2015 Aero Kit; a breakdown of the major parts and changes on the car compared to last season. More articles will be posted about specific features of the car and more in depth looks and “technical analysis” for mechanical and design aspects of the car will show up, too. If you have any questions about the technical aspects of the car or what the new parts are for, let me know in the comments below or on Twitter! We’re waiting on you now, Honda.